William Pelley 1885. Image courtesy of the North Carolina Office of Archives and History, Raleigh, NC. Pelley was born April 12, 1885, in Lynn, Massachusetts, the son of William and Grace Goodale Pelley. At the age of nineteen he began publishing The Philosopher, the first of his many publications. After a stint editing a Vermont newspaper, Pelley went abroad to work as a journalist. He covered the Russian Civil War as a correspondent for the Saturday Evening Post. After returning to the United States, Pelley moved to California and worked as a novelist, screenwriter, and magazine publisher. In 1928, however, he underwent a startling spiritual transformation. He claimed to have had an-of-body experience and to have spent “seven minutes in eternity.” His retelling of the event, published in America Magazine, won him national fame. Pelley then moved to Asheville, where he oversaw an ever-expanding empire dedicated to his “Liberation Theology” (Not to be confused with the theology that motivated civil rights protestors in the 1950s and 1960s). To spread his peculiar mix of Christianity and mysticism, Pelley founded Galahad Press and used it to publish the New Liberator magazine. Galahad Press was soon complemented by Galahad College. The college offered courses in Ethical History, Spiritual Eugenics, and Cosmic Mathematics. But Pelley was concerned with more than religion. He called for a “Christian Commonwealth,” a new kind of government that blended elements of fascism, socialism, and theocracy. In the Christian Commonwealth there would be no paper money, no bankers, and no big cities. Jews were also excluded. Pelley, a rabid anti-Semite, believed that Jews should be isolated in walled-off cities. Adolf Hitler’s rise to power had an electric effect on Pelley. On January 31, 1933, the day after Hitler took control in Germany, Pelley founded the Silver Legion of America, better known as the Silver Shirts. The Silver Shirts were deliberately modeled on the Nazi Brown Shirts. Its members wore a military-style uniform of corduroy trousers, a blue tie, and a silver shirt with a red “L” over the heart. Chapters of the Silver Shirts sprang up in twenty-two different states. Although Pelley claimed to have as many as 100,000 followers, the actual number was closer to 15,000. In 1936 Pelley ran for president as the candidate of the Christian Party. His platform mimicked the program of the Nazi Party. It called for the registration and persecution of all American Jews. The Christian Party got on the ballot in only one state, Washington, where it received a mere 1,598 votes. Eventually, President Franklin D. Roosevelt stopped Pelley’s increasingly disturbing rhetoric. Roosevelt asked Attorney General Francis Biddle to investigate Pelley on charges of sedition and insurrection. Pelley was arrested in April 1942, tried, and found guilty on eleven charges. He was sentenced to fifteen years in a federal penitentiary in Terre Haute, Indiana. After being released in 1952, Pelley spent the rest of his life in Noblesville. There, he developed an elaborate religious philosophy called “Soulcraft,” based on his belief in UFOs and extraterrestrials. He died June 30, 1965. Scott Beekman, “Pelley, William Dudley,” http://www.anb.org/articles/15/15-01310.html (Accessed May 18, 2010); Scott Beekman, Silver Shirts and Golden Scripts: The Life of William Dudley Pelley, PhD dissertation, Ohio University, 2003; Jon Elliston, “New Age Nazi: The Rise and Fall of Asheville’s Flaky Fascist,” Mountain Express, Vol. 10, No. 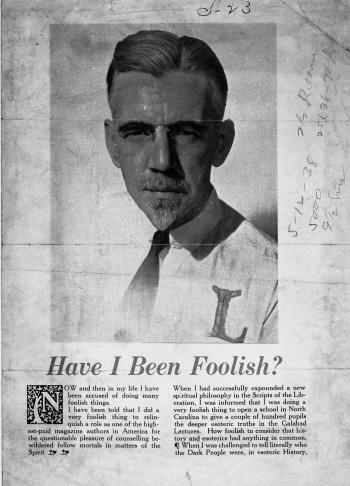 25 (January 28, 2004); Suzanne G. Ledeboar, “The Man Who Would Be Hitler: William Dudley Pelley and the Silver Legion,” California History, Vol. 65, No. 2 (June, 1986); David Lobb, “Fascist Apocalypse: William Pelley and Millennial Extremism,” Journal of Millennial Studies; Time, May 7, 1934; January 27, 1941; February 2, 1942.